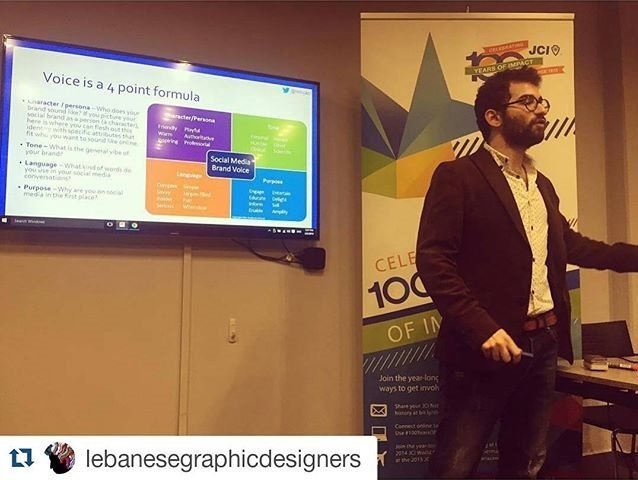 JCI Beirut hosted me on Wednesday March 2, 2016 to conduct a hands-on training about Social Media Strategy at Berytech Beirut Digital District. In this workshop, where more than 50 people from different backgrounds (students, fresh graduates and professionals) attended, I explained how to create a social media strategy for business. The points discussed included examples of brands that do not have a proper strategy, defining social media goals, the sales cycle, asset mapping, defining the audience and creating personas, choosing channels, voice & tone, posting frequency & time, crisis management, and understanding Facebook's algorithm. The session was followed by a Q&A session. I was really overwhelmed by the positive feedback from the attendees after the session especially that several ha said that they learned so many new things that they have not learned when they took expensive workshops or companies. It had been almost two years since I had given a public social media workshop in Beirut. I haven't realized that the demand on my workshop was so high until we noticed that the event on ihjoz was fully booked in one day and then double booked in 4 hours! I promise to conduct more public workshops about different social media topics soon! You can check my slides from the workshop below. If you have any questions or need advice, feel free to email me on mhijazi@onlinecollaborative.org.